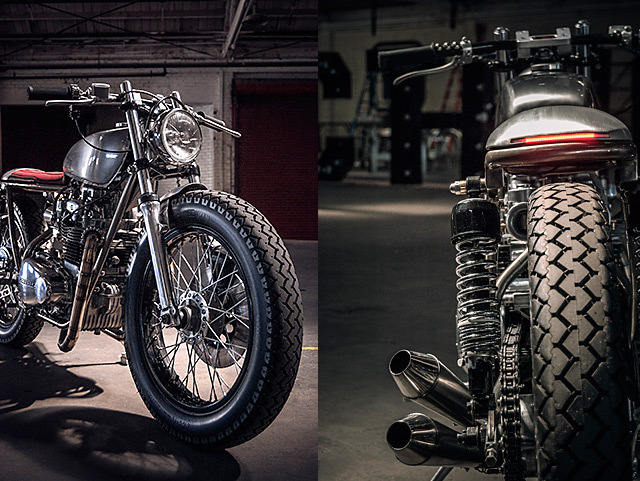 When Sergio Manrique a Colombian Tattoo artist brought them this project and gave the guys total design autonomy they knew they had just the bike for a special occasion. 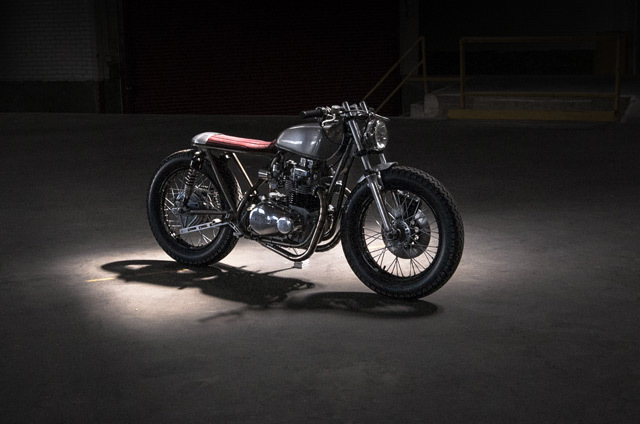 With an invitation to bring one of their creations to The Handbuilt Motorcycle Show in Austin, Texas, they knew lying beneath the rusty old tins of the KZ400 was the skeleton of a bike that they could fashion by hand and simple tools into something truly special. With their backs against the wall having to get the bike transported to another continent, clear customs and make it to the show, Garaje 57 rose to the occasion. 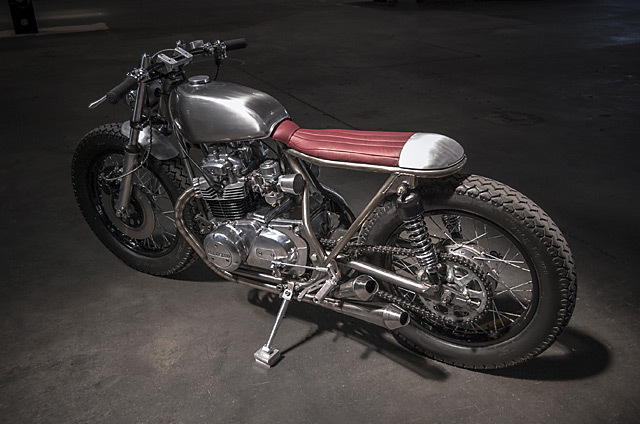 A complete teardown was the first port of call and where many might simply de-tab the frame or go a little further and construct a new subframe the boys at Garaje 57 wanted to go extreme. It’s fair to say that more than 50% of the frame is now completely new; the backbone was extended with large diameter round tube, from there two supports run down to the lower cradle and swingarm support, while a custom looped subframe triangulates between the rear supports and the single backbone. The work and welds are flawless with only additional bracing and the vital mounting points retained for an ultra-clean look. Not content with building such an incredible frame the guys then spent a week cleaning and using a brass brush to finish the frame to draw out the unique colours of the raw steel before sealing it all in with clear powder coat. 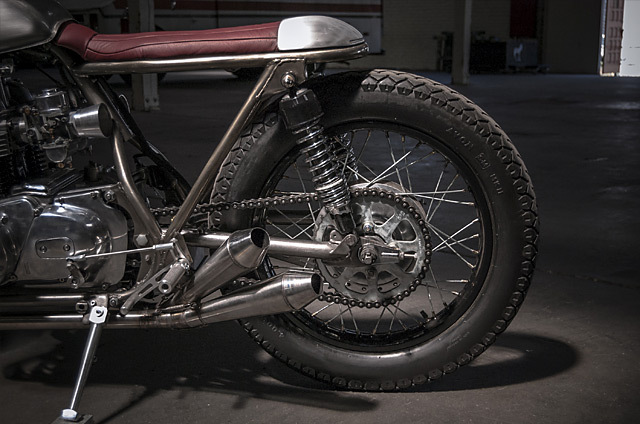 With the frame finished off they had the perfect place to rest the 398cc four stroke twin, but you couldn’t slot in a dirty 70’s lump to such a nice frame. So the engine too received a full strip down and was completely rebuilt from top to bottom. The cases received a bunch of Garaje 57 elbow grease and are now heavily polished, with the barrels blacked out and the heads also cleaned up. The factory Keihin CVB carburettors have been polished and then the boys turned quite literally to their lathe to produce two velocity stacks from a solid piece of 7075 aluminium. So happy with the look of the machined items they turned out some more including giving every bolt on the bike the lathe finish to their heads. Like the rest of the build the exhaust shows off exactly what Garaje 57 is all about, quality materials, hand crafted, time consuming, it’s automotive perfection. The entire system is built from straight pieces of stainless steel that is lobstered together and so committed to perfection are our Colombian friends they did every weld using the back purging process. From the beginning the vision was to create a low and slim lined machine with only the bare necessities fitted. 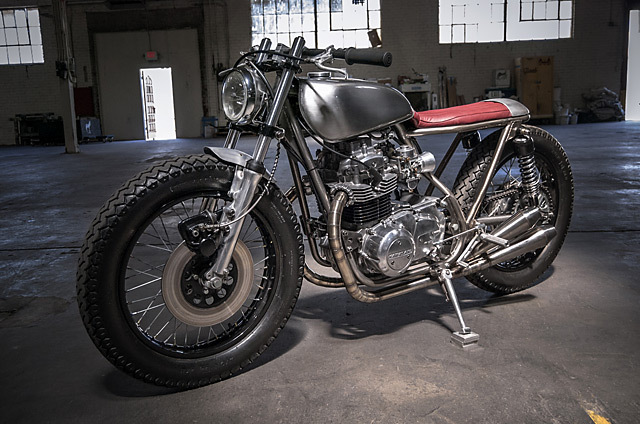 The stock KZ400 tank is a nicely shaped item, but wanting to further expose the engine the choice was made to use a smaller tank from a Honda XL 125. Just like the frame the tank is brought back to its best metal finish, clear coated and topped with another lathe turned piece in the form of a slimline gas cap. Diving back into their metal work bag of tricks the seat is a single piece of aluminium that is formed at the back to create a low height hump. 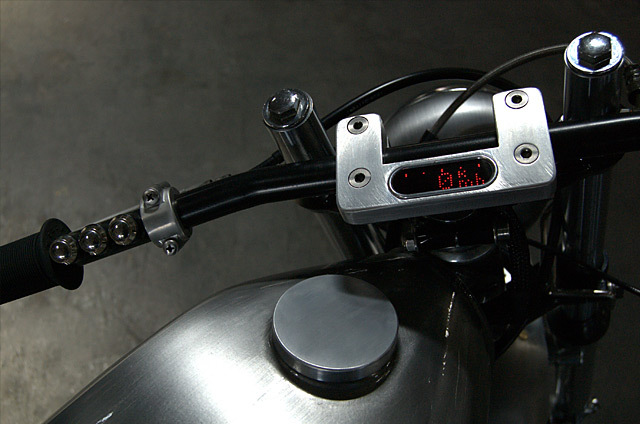 No welds, not cuts, just hand formed metal work that also includes a cut out for the LED rear light strip. Providing a brilliant contrast to the variety of metal finishes is the single piece of bold colour in the form of the maroon leather covered seat. Back at the lathe and mill a custom set of risers have been fabricated from the same high end aluminium as many of the other parts on the bike. But these aren’t any ole risers; they have been machined to house a small motogadget digital dash, while also clamping a set of drag bars. Rather than use the 1970’s switch blocks that can be difficult to restore, more machining created a set of alloy button housings which are complemented perfectly by the Italian Kustomtech levers. The wiring from the switch blocks is part of the completely new loom that is hidden in an aluminium tray along with a lithium ballistic battery. With the Kawasaki now slim and clean the low element of the design comes courtesy of the standard front forks absolutely slammed through the triple trees. To get the bum down closer to terra former a set of custom lowered rear shocks now slot into the new mounting points. The 1974 original rims were restored with soda blasting and then topped with black powder coat for a durable finish. Wanting a tyre that was a mix of café and tracker the choice of Avon Mark2s is spot on and the classic tread pattern a perfect match. 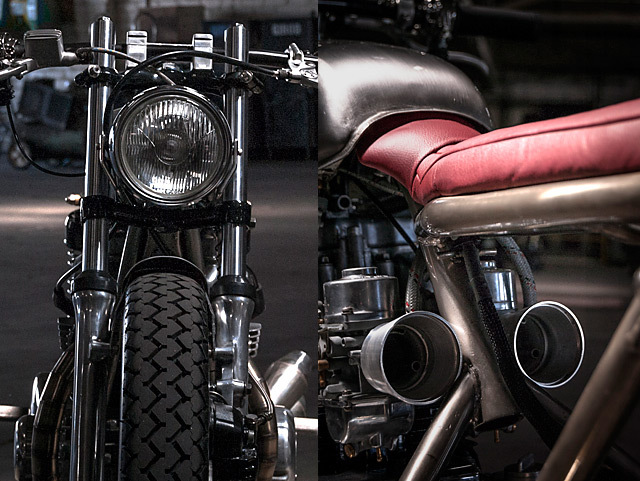 The finishing touches come in the form of the heavily bobbed front fender, a vintage headlight that is mounted with stainless brackets the guys whipped up and a handmade aluminium side stand made by… you guessed it, Garaje 57! 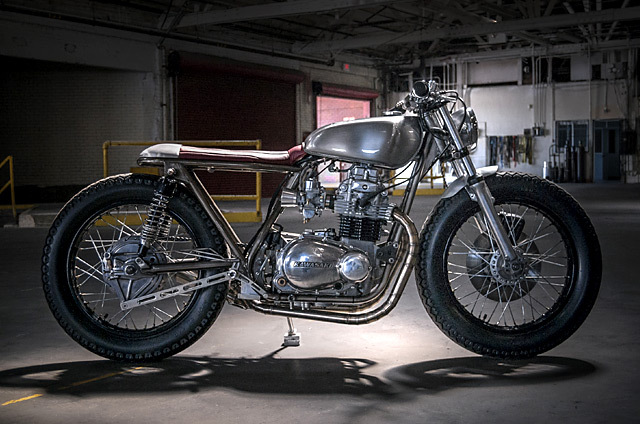 While in the US the bike was given a finishing touch from Rafael Portillo at VURO who fabricated the rear brake support from stainless steel and then upon invitation from Esteban and Gustavo named the bike. 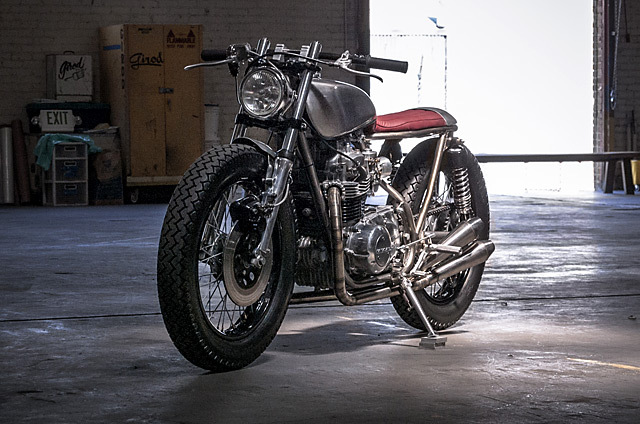 For evermore this hand crafted Kawasaki that has been subject of hundreds of hours of manual labour, crossed continents and drawn huge crowds at one of the industry’s leading shows will be known as “Angelina”. Ella es Hermosa!